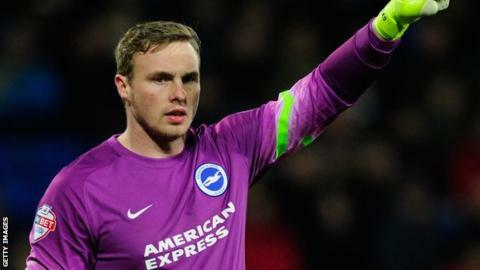 Brighton & Hove Albion goalkeeper David Stockdale says he will use recent criticism from fans as motivation. The 29-year-old's aborted attempt to claim a cross led to Nottingham Forest's first goal in their 3-2 defeat at the Amex on Saturday. "I know there are a lot of people trying to call for my head. "I get upset and I use it as a fire. When it comes you have got to be a big person and know that you are in the wrong," he told BBC Sussex. "The manager is confident in my ability to come out and perform. "Mistakes do happen. We are not happy that they happen but you have got to learn from them and move in the right direction." The former Fulham man acknowledged that the team need to eliminate errors is all areas if they are to climb the Championship table. "People think I must go home and start laughing about goals we concede, but that is not the case," he said. "I am just as mad about it as anyone else. As a group we all look at how we can improve." Stockdale has made 31 appearances for the Seagulls since his move to Sussex last summer, with his only prolonged spell out of the side coming in November because of a finger injury. However, he accepts his place is under threat from highly-rated teenager Christian Walton. "Anyone can lose their place. You are always concerned when you are letting soft goals in like that [against Forest]," he said. "I felt I hadn't made a mistake like that since Cardiff at home. "There is a good goalkeeper behind me and it keeps you on your toes. If you keep carrying on making mistakes your place is at risk."